I had to run out yesterday during the snow storm on a few errands. Well, I didn’t really have to, but the equation Snow Storm + Camera + 4-Wheel Drive = Photo Opp. There were very few cars on the roads since all the schools were closed and the roads that are normally traffic filled, were wide open and I felt like I owned them. On my way home I decided to stop by one of my favorite places to shoot; the meadow. It was so quite as the snow fell. It clung to each branch, twig and weed and showed off all the bones of the landscape as if to pay its respect for holding on through the winter. As I walked deeper into the meadow, there were no other human footprints through the snow and felt a peaceful solitude come over me. Quite. Peaceful. Winter. 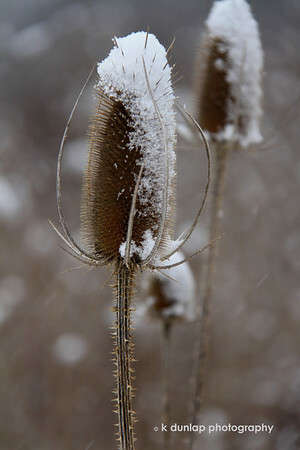 Lovely contrast between the snow and the plant -- wonderful winter shot! Wonderful symmetry...the shallow depth of field makes manifest your verbal description..."It clung to each branch, twig and weed..."
i would have stayed in and missed this beautiful shot. I admire you for getting out in the cold and snow. Neat shot. Great eye! I would have likely walked by this and missed the opportunity to get a great photo like this one. You help me realize that I need to dust off my macro lens and pay attention to the little things. Looking forward to an SP post from you! Lovely shot and a wonderful description of your experience. What a wonderful experience and a great capture to represent what you were feeling, very powerful picture. super capture! love the bokeh! I love it. You made a winter weed truly beautiful. Love the Q.P.W. part too!